Belt Palace specializes in hard-to-find Go Kart Belts, Go Kart Clutches & Parts, Poly-V (Micro V) Ribbed belts, Industrial V Belts, Timing belts, Cogged Belts, Treadmill and Exercise Belts, FHP Belts, Lawn Mower Belts & Idler Pulleys, Replacement Drive Belts and Electrical supplies. Shop with confidence! If you need any assistance, please Prefer to talk to a real person? You can reach Customer Service at (317) 519-9020 Mon-Fri, 7AM to 4PM EST. Please leave a message if we are unable to answer immediately. We'll call back ASAP! Note that our Warsaw Indiana store location hours vary by season, but generally we do business Mon-Fri, 8AM to 4:30PM EST, SAT 7:30AM to 12PM if you are in the area. In your Shopping cart, please select a shipping method and click "Apply" to see the fee added to your sub-total. Domestic USPS Delivery Confirmation and insurance to $50.00 USD is included automatically at no charge. REGULAR MAIL (First Class) does not include insurance. USPS Tracking/Delivery Confirmation may not be available outside the USA. Restrictions apply. A Handling Fee applies to each order and is automatically added to Shipping charges at checkout. 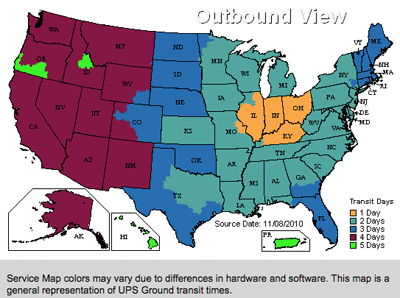 UPS rates and fuel surcharges are calculated based on your shipping destination from Indiana, USA. Please understand that we are not responsible for delayed or lost parcels once accepted by the shipping provider. Delays or lost parcels must be reported by and resolved by the receiver with the respective shipping service provider. Thank you! 2019 Postal Holidays: NO MAIL DELIVERY OR PICKUP. Full list of USPS Holidays & Events Schedule USPS HOLIDAY AND EVENTS INFO. Please contact UPS or view their 2019 UPS Holiday Schedule for more information and tips on seasonal shipping. Our international customers must understand that we are not responsible for fees added to your shipment by U.S. Customs or any other International package handling agency. The shipping fee we charge is for sending the package to your address from our location to the US Customs Agency. In the case that added costs do apply to the customer's shipment, the customer is responsible for any and all additional fees, taxes, duties, etc. associated with the shipment. Belt Palace is not responsible for the delivery of packages once accepted by the United States Post Office. Please contact them directly via http://www.usps.com to trace your shipment. International customers should also contact their respective Customs Agency and/or Post Authority to research missing or delayed shipments. Thank you for your understanding! Beltpalace.com, a division of Service Electric, Inc. is here to service online consumers searching for durable name-brand power transmission belts. We stock a huge variety of power transmission belts for such applications as Lawn & Garden belts, Timing belts, Ag belts, Poly-V Belts, Exercise & Fitness equipment belts, Go Kart Belts, CVT Clutches, Heald & Kimball Hauler parts and belts, power tool drive belts, and more. Please notice that we recently added Go Kart Belts to our online selection! As always, BeltPalace.com offers low prices on power transmission belts. BeltPalace.com wants all our customers to have a positive shopping experience and we do our best to provide the most accurate information to the customer prior to purchase. We do have a few simple policies that we must follow: Please contact us for acceptable Return Material Authorization (RMA) instructions on returns or exchanges. Original shipping and handling fees are non-refundable. Unused items may be returned within 15 business days and require prior authorization. Please understand that any parts returned that appear "used" or otherwise damaged condition will not be eligible for a credit/refund. Postage due packages will be refused and returned to sender. A minimum restock fee of $1.00 USD will apply to all orders. Restocking fees vary by item category. Refunds are usually processed within 4 business days of receipt. Return shipping fees are paid by and are the responsibility of the customer. Policies, prices and fees are subject to change without notice. Some restrictions apply. Our site is currently hosted by Aabaco Small Business (formerly Yahoo! Merchant Solutions, however some "Y!" logos and badges may remain while in transition to Aabaco). Aabaco Small Business LLC hosts the store pages, ordering system, and order data. We sometimes use third-party web beacons from Aabaco LLC to help analyze where visitors go and what they do while visiting our website. Aabaco LLC may also use anonymous information about your visits to this and other websites in order to improve its products and services and provide advertisements about goods and services of interest to you. If you would like more information about this practice and to know your choices about not having this information used by Aabaco LLC, click here. We are not in any way affiliated with Aabaco LLC and cannot be held responsible for offers not made directly by Beltpalace.com, a division of Service Electric, Inc.
- Thank you! We appreciate your business!